Prior to core drilling through elevated slabs, walls or columns, or simply trying to identify unknown embedded items in concreteTTI provides radiographic examination or ground penetrating radar of those areas of interest to identify embedded post tensioned cables, conduits or reinforcing bars. 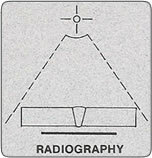 Radiography is performed on slabs up to 24@ thick and provides our clients with a picture of items embedded in the slab. Radiographs provide an image which makes it possible to identify strands in cables, wires in conduits and a general idea of the depth of each embedded item. Radiography is generally performed after normal business hours to insure that the area around the investigation location is clear of all personnel. TTI is licensed by the Nuclear Regulatory Commission to possess and use radiation sources. Testing Technologies, Inc. uses strict procedures approved by the NRC to ensure no radiation exposure is received by non-radiographic personnel. Clients are requested to complete a CONCRETE CHECKLIST prior to work being performed. This will assist our clients in preparing the test areas correctly prior to our arrival. Ground Penetrating Radar utilizes radar signals which are introduced into the concrete as the radar antenna is passed over the area of interest. The signals which strike an embedded metallic item is then returned to the radar unit and is displayed as a hyperbola as the screen scrolls. This method may be performed during normal working hours. This equipment can provide images in Aline scan” or in 3-D. Normal scanning for embedded items is usually performed in the line scan mode. This is where several scans are performed around each location and the embedded items, which appear as hyperboles, are measured and marked on the slab. The 3-D mode is primarily used as an engineering aid when performing redesign of a particular area and the bar or cable spacing is unknown. The limitations of this method include the slab thickness, slabs 12 to 18 inches should be scanned from both sides, and penetrations must be located a minimum of 6@ from any vertical obstruction, such as a wall.